At UFC 232 to close out 2018, we saw a late candidate for submission of the year when The Ultimate Fighter season 15 winner, Michael Chiesa (15-4) locked in a kimura that handed former UFC interim welterweight champion, Carlos Condit his fifth straight defeat. A few months later early into the new year, we also saw another crazy sight as the iconic TUF 1 winner, Diego Sanchez (29-11) got his first win by finish in 11 years when he TKO’d Mickey Gall in round two of their UFC 235 clash. Now, it looks like both men could be next to face off inside the Octagon. ESPN’s Ariel Helwani is reporting that the UFC is looking to make the bout between the two official for UFC 239 on July 6 for International Fight Week. 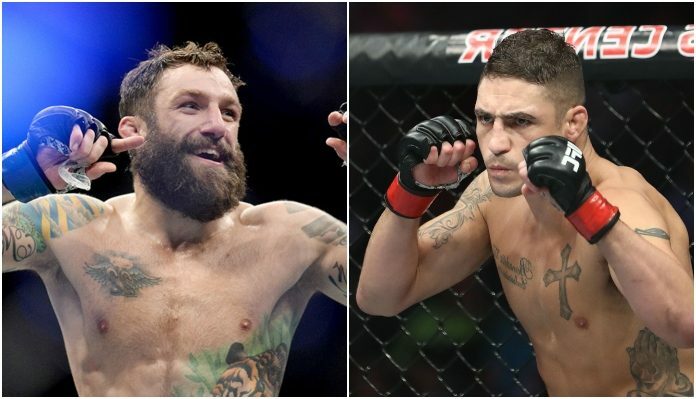 “UFC wants to book Michael Chiesa vs. Diego Sanchez for UFC 239 on July 6 in Las Vegas, according to sources. The fight isn’t 100% set or signed yet but that’s the direction they want to go in.” Helwani tweeted. For Chiesa, his last bout with Condit was his welterweight debut. The win snapped his two-fight losing streak at lightweight which saw him suffer back to back losses to the likes of Kevin Lee and former lightweight champion, Anthony Pettis. Sanchez, on the other hand, now rides his first winning streak since 2011 with his wins over the aforementioned Gall, and Craig White who he defeated at UFC 228 in September 2018. As usual, the UFC’s big International Fight Week card is really looking to be a big one as it already has its two title fight headliners along with a collection of top contender bouts. See what’s currently in store for UFC 239 below.